Thomas Law Office is a family law practice that handles divorce and bankruptcy cases, as well as child custody, child support, adoptions and more. For over 14 years, we have been serving the needs of clients throughout McHenry County and Kane County in cities such as Elgin, South Elgin, Carpentersville, Marengo, West Dundee, East Dundee, Algonquin, Lake in the Hills, Huntley, Crystal Lake, Woodstock and Cary. At our firm, attorney Colleen Thomas brings more than 16 years of experience to every case to provide superior legal representation. Ms. Thomas gives each client one-on-one attention, firmly believing that individual service is the key to success in family law. 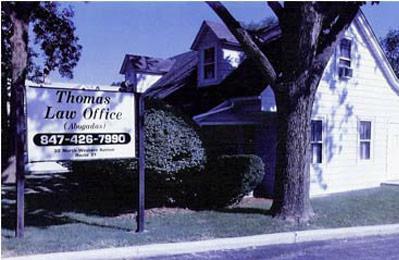 Thomas Law Office stands apart from the competition in many ways. We are an owner-operated firm, which means that you will deal directly with attorney Colleen Thomas for your case – not an associate or paralegal. Another benefit of hiring our firm is our dedication to offering affordable legal assistance. We are committed to conserving attorney’s fees whenever possible. While some lawyers will trump up their billable hours with needless paperwork, Colleen Thomas is skilled at working expeditiously so that you are only charged for the work that your case requires and nothing more. Taking Care of Your Needs, Every Step of the Way. Divorce is a sensitive issue that requires the ability to not only handle all legal matters with skill and proficiency, but also to empathize with clients during difficult, emotional times. Attorney Colleen Thomas treats every client with respect and discretion so that the best possible results can be achieved. Further, she is qualified to practice at both the state and federal level, including trying cases in front of the U.S. Supreme Court. This is an honor only bestowed upon the most prestigious lawyers, qualifying Ms. Thomas to take your case from initiation to trial and appeal at the highest levels. If you are dealing with divorce, child custody or other family law issues, contact attorney Colleen Thomas at Thomas Law Office today. Call 847-426-7990 or send an email to schedule a consultation for your case.